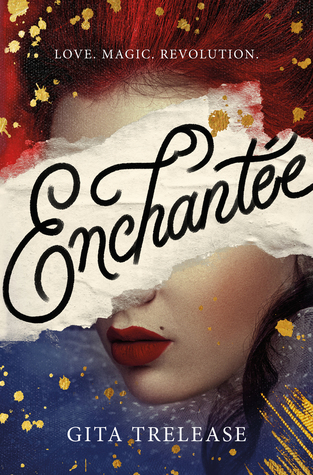 Camille is a young woman living in Paris just before the French Revolution. Her parents have died of smallpox and her brother, Alain, is in the grips of alcoholism and gambling addiction. To support herself and her younger sister, Camille uses magic to turn bits of junk metal into coins, just enough for them to eke by. But after Alain's gambling gets them into more hot water than usual, Camille decides to risk even more dangerous magic in order to disguise herself as a noblewoman and engage in some high stakes gambling at Versailles. And then...uh...some...stuff happens? It was a very good set up, but then the rest of the book kind of took a wandering turn to just sort of spend time at parties in Versailles. There wasn't much of a plot besides Camille getting to know a whole cast of colorful new characters. A lot of the page time in Enchentee was given over to Camille's inner monologue and the extremely complex and tumultuous emotions she was going through. Still processing the death of her beloved parents and the loss of her former life, wrestling with her fears and abandonment issues, nurturing a resentment of the ruling class, it was all great stuff. And for the most part, I really liked her character. She was realistic and heartfelt and had a rich amount of potential. Most of the book was slow and introspective and focused on Camille just existing and feeling things and starting a new romance with a nifty new beux. And that's fine. But there were hints and teases of a more tension-driven plot that just didn't go anywhere and it made me thing there was supposed to be something more that I just wasn't getting to yet. Which, in turn, made the whole thing feel like a drag. I kept waiting for this vaguely ominous bad guy to do something. I kept waiting for these threatened consequences to amount to anything. I kept waiting...and waiting and waiting and nothing much really happened. It would have been fine if I could settle into things, but the feeling of waiting was tedious. You...you know there's a revolution coming, right? For a book set at the edge of the French Revolution, there certainly wasn't a lot of rebelling going on. Certainly, Camille's hardscrabble life is contrasted with the excesses of Versailles, and she spends the odd occasion here and there waxing poetically in her head about freedom of the press. There's two scenes of other people being rebellious. But outside of that, it's just...rich people being fancy. While there wasn't any outright praise for that lifestyle, I got the impression of a kind of soft-core sympathizing for the nobles as a group. And of course, my least favorite, the old "okay, but the noble characters we like are NICE to their subjects." It was just an...uncomfortable focus, given the time period, to have such a relatively uncritical framing of this class of people while the other classes are largely absent from the narrative. There's not enough consequence for the magic. There's talk of terrible consequences, but none of them show up on page or have any relevance. Sexual violence and prostitution is used as a vague threat, a "oh no, that'll be me if I can't get enough money" kind of line. Very unnecessary. The villain has extremely unclear motivations, although his plan at least made sense and was scary. The romance between Camille and Lazare was really cute and sweet. I liked most of the side characters, even if I very aggressively do not care about Chandon's family going bankrupt. Or any of their families, really. Will I continue this series? Probably not. Given that the sequel is pitched as "watch all these rich noble characters try to survive the Revolution" and...erm...I'm kind of on the Eat the Rich side.